Two separate pathogens (A. brassicicola and A. brassicae) are responsible for alternaria leaf spot in cole crops, a fungal disease that wreaks havoc in cabbage, cauliflower, Brussels sprouts, broccoli and other cruciferous vegetables. However, symptoms and treatment of this hard-to-control disease are similar, regardless of the pathogen. Read on to learn more about leaf spot on cole vegetables. The first sign of leaf spot on cole vegetables is small, brown or black spots on the leaves. Eventually, the spots enlarge into pale brown or tan circles. Dark, fuzzy or sooty spores and concentric, bull’s-eye rings may develop on the spots. Eventually, the leaves become papery and may take on a purplish color. A hole appears where the dead tissue drops out of the leaves. 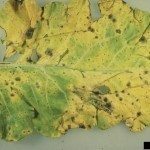 Causes for cole crops with alternaria leaf spot include infected seed and spores that spread quickly by rain, overhead irrigation, machinery, animals or humans. Additionally, the spores, which can travel more than a mile, are windblown from garden debris, especially from wild mustard, shepherd’s purse, bittercress or other weeds in the Brassicaceae family. Alternaria leaf spot in cole crops is favored by extended wet weather, or any time the leaves are wet for more than nine hours. Use disease-free seed. If this isn’t possible, soak seeds in hot water (115-150 F./45-65 C.) for 30 minutes. Practice a two-year crop rotation, alternating cole crops with non-cruciferous crops. Don’t plant cole plants near an area where cruciferous plants were grown within the last year. Spray plants with a fungicide immediately if you notice signs of the disease, as fungicides are only effective when used early. Avoid crowding plants. Air circulation will minimize infection. Avoid excessive irrigation. Water at the base of the plants whenever possible. Otherwise, water early in the day if you use overhead sprinklers. 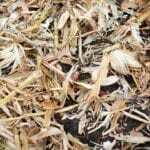 Apply straw mulch around cole plants, which may provide a protective barrier against the spores. This should also help in maintaining good weed control. Plow plant residue into the soil immediately after harvest.